As he prepares for the World Series, Red Sox right-hander Nathan Eovaldi says he has yet to have any talks with the club regarding a deal that would keep him off of the open market, John Tomase of WEEI.com reports. The hurler says he’d “love to be back,” though unsurprisingly it looks as if he’ll test the open market first. It’s certainly possible to imagine a fit with Boston, though the same could be said of quite a few other organizations as well. There’s some belief that the Rays will land Cuban righty Sandy Gaston, according to MLB.com’s Joe Frisaro (Twitter links). Two other top players, the Mesa brothers, landed with the Marlins today. The Orioles had been seen as a chief competitor for these and other top young players who are eligible to sign rather than entering the draft. To date, though, the club has largely kept its war chest intact. Frisaro says it’s believed that it would cost Tampa Bay around $2MM to secure the amateur. The lack of a suitable defensive position has long been the primary concern with Tigers slugger Nicholas Castellanos. As Anthony Fenech of the Detroit Free Press writes, GM Al Avila says the current plan remains to keep Castellanos in right field, where he has “made some strides.” As Fenech writes, though, there are some good practical reasons to consider utilizing Castellanos at first base, where he’d be less of a concern defensively and wouldn’t clog up a spot in the outfield for other other players the club would like to get a look at. Of course, the first base position is spoken for, at least for part of the time, by Miguel Cabrera. Despite a disappointing end to the 2018 season, the Astros enter the winter with a great deal of confidence in their existing roster, as Chandler Rome of the Houston Chronicle reports. Unsurprisingly, though, GM Jeff Luhnow identified starting pitching and catching as two areas that will need to be addressed. In other Astros news, the organization is expected to retain all of skipper A.J. 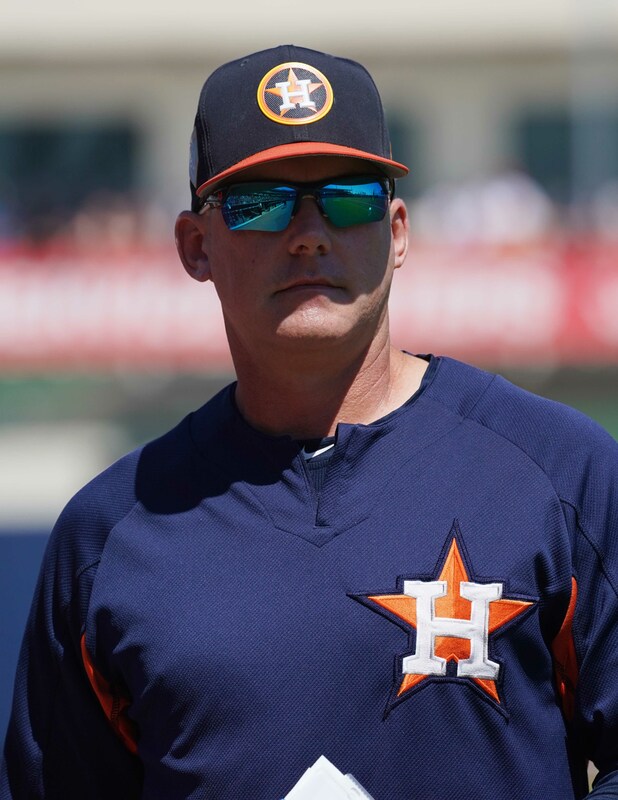 Hinch’s coaches, Luhnow tells Rome (via Twitter). All are already under contract, per the GM. Of course, bench coach Joe Espada has received strong interest from other organizations as a managerial candidate, so it’s still possible the club will need to make a new hire. Aug. 30: Astros owner Jim Crane and president of baseball ops Jeff Luhnow have announced Hinch’s new contract at a press conference. Hinch signed a four-year extension that is guaranteed through the 2022 season. Aug. 29: he Astros have agreed to a contract extension with manager A.J. Hinch, reports Mark Berman of FOX 26 in Houston (Twitter link). A formal announcement of the move will come tomorrow, per the report. While the length of the new contract is not yet clear, general manager Jeff Luhnow said earlier this summer that his hope was to “have [Hinch] here as my manager for as long as I’m here” (link via The Athletic’s Jake Kaplan). Those comments were made on the day that the organization announced an extension for Luhnow that runs through the 2023 season. Hinch, 44, is in his fourth season at the helm of the Astros — each of which has been a winning season. After winning 86 and 84 games, respectively, in his first two seasons as the Houston manager, Hinch of course guided the Astros to a 101-win season and an eventual World Series championship in 2017. The Astros just wrapped up their 82nd victory of the season and are currently two and a half games up on the Athletics in a surprisingly competitive AL West division. Hinch was already under contract through the 2019 season via a club option that long looked like a lock to be exercised, but the new agreement will prevent him from heading into the 2019 season with any questions surrounding his long-term standing in the organization. In all, the Astros are 353-266 under Hinch. Hinch’s managerial career got off to a rough start when, after previously serving as the D-backs’ director of player development, he was named the team’s manager at the age of 35 in 2010. The move was widely panned at the time, given his youth and inexperience, and he lasted just 212 games with Arizona in that role before being cut loose. Hinch went on to work in the Padres’ front office as the team’s vice president of professional scouting before returning to the field as the new Astros manager following the 2014 season. Hinch’s experience in player development, the adversity he faced in his first managerial position and his familiarity with analytics and data-driven strategies made him a fit in Houston, and it now seems that the union between the two sides will continue for several years to come. While Hinch has not yet taken home a Manager of the Year Award since being named the Houston skipper, he’s finished second in the voting (2015) and third in the voting (2017) in his short career.